Many of my friends and family are not actually my allies. I've come to realize this. They claim to be good, and purchase pre-packaged good to display proudly on their mantle; "military service" this, "Lions club" that, "Salvation Army" the other, all this quality-controlled, accountable goodness, without stopping to wonder just how much it really matters. They just have documented, quantified proof that they "did good", and, if questioned, they wave it around like having done something in the past grants them "good" status in perpetuity and they're excused from any greater effort unless they're feeling magnanimous. They don't need to seek good, question good, understand that evil exists continuously and good must be enacted and propagated continuously in return. Words and deeds matter, but there is a balance... and we have lost that balance: too many people insist they're good, pointing at the trophies they've awarded each other as proof, and doing as little else as possible. Worse, they do all this while damning those who remind them that there's more good that needs doing, and laughing while they do it. In the last five days, Americans have gone out to live their daily lives and encountered a whole new level of purely spiteful hate; women reminded that they're objects, Hispanics and black people told to go back to Mexico and Africa, Muslims threatened for their faith. It's a new level of blatant bigotry on all fronts, because hate has been validated by allowing the election of bigots and rapists that used money and blanket media scare campaigns to intimidate youth and minorities away from the polls and scare uninformed white people into the polls. These people manipulated us all with media campaigns of pure terror and no truth. Good has lost. Evil has won, and on an unprecedented scale. This shows not only because Trump and Pence won, not just because the Republicans dominate the House, the Senate and, soon, the Supreme Court, but also because the people I thought were good almost universally don't care. They say they do, and wave their trophies around as proof, but then stand idly by while children have to scrape and beg to eat and feed each other in our schools, while police work side-by-side with privately-owned militaries to commit acts of war, torture, and racial and religious oppression in the name of private, corporate profit, women are forced to bear children for a variety of abusive and coercive predators and stripped of their right to decide whether they want to or not, and self-proclaimed Christian activists subject Muslims to a level of religious hatred and persecution that they, themselves, have been taught to fear but have never actually experienced. Good isn't convenient, and it's not always placed on a flyer, a shelf, a TV screen for your easy consumption to satisfy your sense of well-being. Good requires vigilance, thought, concern, and genuine effort, even if that effort is needed outside of business hours. Good requires patience, tolerance, empathy, and understanding that different is not automatically bad, rising above animal instinct to act intelligently, using sentient reasoning and hoping for a better world. It takes real comprehension of informed consent, and how informed consent, for whatever purpose, requires education and cannot be manipulated and coerced. But many people I know, with their self-importance and their “done good” trophies, their social circles all patting each other on the back and shaking each others' hands, actually abuse this same system, predating others to obtain the illusion of informed consent for their own benefit and only apologizing if caught, after the profit or the gain has been made... a radical, insidious and horrific abuse of the axiom “it's better to beg forgiveness than ask permission.” In fact, this is the position of the majority of America: capitalism, not for humanity, as it should be, but at the cost of humanity. I'm an Atheist, but I've read the Christian Bible twice in my life. The first time, I was angry and wanted material to point at and be angry at. The second time, I was looking for a message, for whatever it was that people were so hung up on in this book as a whole. I actually found a message, underneath all the dogma and the political editing to give long-dead men “Divine Right”, and it was early on, when the idea of the book as a collection of parables meant to teach people good living by way of example wasn't quite completely bogged down by centuries of politics and fearmongering. The heart of the message was “be good.” Not “behave, and you can have the doggie treat called Heaven”, not “behave, or I'll spank you with a lake of fire for all eternity”, not “be good because an identifiable incarnation of good asked you to in order to make it comprehensible to peoples driven by self-interest”, but just “be good.” Because good is an amazing thing to be. Why I am not grateful. I do appreciate the efforts of veterans, and I care about them deeply, but the ideals they fought for, put themselves through Hell for, are not the ideals we have here, and most Americans are too shallow and self-centered to care or take any responsibility for the difference. If you hope to have allies, you should be an ally. I'm still busy, just so the world knows. Things have been hectic, but I have irons in the fire, such as an article about the misconception of forgiveness as a right, a Christmas list and thoughts about the Standing Rock Sioux and the #NoDAPL movement, which I support wholeheartedly. More soon. Why I won't vote for Gary Johnson. - He's against mandatory vaccines. I find this unconscionable. Perfect safety isn't possible... but vaccination of the population has all but eliminated terrible diseases that used to be death sentences. The entire anti-vaccination movement was started by a doctor for personal profit, and has been picked up by pseudo-intellectuals who look at component names and object without realizing much of medicine is chemistry, and chemistry is never as simple as it looks on the surface... but, since these pseudo-intellectuals are famous, they don't actually have to educate themselves any more than is convenient to make them look good... or to keep them from having to admit they've made a mistake. There is no fence-sitting on an issue like this: vaccines are necessary for (and for the protection of) U.S. citizens. - He's against government regulation of employment practices. Employers, as entities, are sociopathic and expect their management to behave sociopathically, even if an individual manager isn't; the fallback is that the action is the manager's, but the blame goes to the faceless employer entity. The government is supposed to provide a basic level of care and safety to all citizens, and that includes protecting us from extremely predatory employment practices. This is why we have and need unions, despite their many vulnerabilities to possible abuse, and this is why big business doesn't want government regulation of business. - He's against more gun control. I feel that gun ownership should at least require a level of documentation and training similar to motor vehicle ownership. Both have their practical function, but both can easily take lives if misused. - He's against federal health care. He wants a sociopathic free market to provide what every American should have a right to: viable basic health, mental health, dental and vision care. And, let's be honest, those are separated for market reasons, to enable selective price-gouging... they're ALL "health care", and every American deserves reasonable health care. - He wants to raise the retirement age to 75, and subject retirees to means testing. This puts retirement age past the average life-expectancy of many people, and puts undue burden-of-proof on those that are already elderly. - He wants to privatize Social Security. This (and the above) is a dodge to avoid the government having to repay what they "borrowed" from this supposedly-untouchable "private for the citizens" retirement fund and minimize payouts by putting retirement out of reach of most people. - No federal funding for mass transit. Motor vehicles are a significant burden on the average family, thanks to predatory, opportunistic, largely-unregulated free-market practices that minimize reliable pay and free time, and maximize vehicle wear and employee fatigue and health concerns. National travel infrastructure (such as road and bridge repair) needs more support, and mass transit should be included in that. Many poor need mass transit; it should be more available and reliable. - Weak on environmental issues, wants to leave most of it up to state and local levels. The nation needs to take a stronger stance on environmental restrictions. Flint, MI and East Chicago, IN demonstrate why... again, big business is sociopathic, and there's profit in ruining the environment and then apologizing after the money is made; however, not ruining it in the first place costs money. - Supports making schools compete. We need schools across the nation to share the load of providing a solid, uniform core education to all American students, to strengthen our overall self-reliance as individuals and as Americans. School resources should be distributed more evenly across the country for the well-being of all our children. ...instead of early release of nonviolent offenders or exploring rehabilitation options. He gave cost as an explanation for his reasoning. - Business acumen is relevant to someone who started a one-man handyman business and grew it to over a thousand employees... back in the 70s, 80s, and 90s. He's out of touch with the post-9/11 modern, sociopathic predatory-capitalist market, but uses this to claim otherwise. He ignores massive corporate exploitation of government resources for private profit, and corporate exploitation of Americans as a workforce with efforts to avoid providing benefits by any means necessary. These practices exploit both the aforementioned government resources and the health, mental health, and well-being of Americans, all for the bottom line of a few private corporate predators. - He's out of touch with foreign affairs. He has demonstrated more than once, with his self-styled "Aleppo moments", that he is not very familiar with foreign affairs. While I don't think the U.S. needs to have it's fingers in every foreign action, and I feel that we're massively overdoing the "world policing" attitude, I do think that, even if we were to pull back from some events, our President should still know is going on. I'm going to lay this on the table: The BIG reason he's popular with self-styled "radical" objection voters is that he supports recreational use of weed. I don't smoke weed, personally, but I DON'T CARE if others do... however, the classic "bong culture" mentality is all-time peak of being out-of-control, and this is a prime illustration: "he likes weed, let's vote for him! Hurr hurr hurr." The problem isn't weed, or people who smoke weed, or even that there's a marijuana culture out there... it's that the classic, counter-culture bong culture is outdated. We live in a time where you can speak out about legalizing weed and be heard; there's no more need for the avoidant, subversive culture that's grown up around it these last few decades, but it also shouldn't be the defining point of your life decisions, for you or for others. Before you jump down my throat on this, I KNOW people like this, for whom marijuana and drug politics is important... but not so important that it eclipses their other political choices and concerns. They are the confirmation I need to feel comfortable taking this position... I see them in action, these functional, intelligent, capable human beings, and know it's a reasonable expectation. Fried Pies and Food Thoughts! 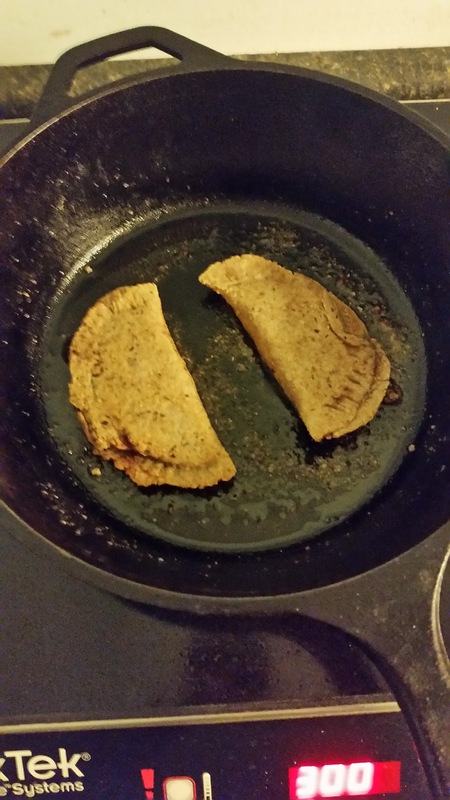 Well, a few weeks ago, I took a shot at making fried pies. 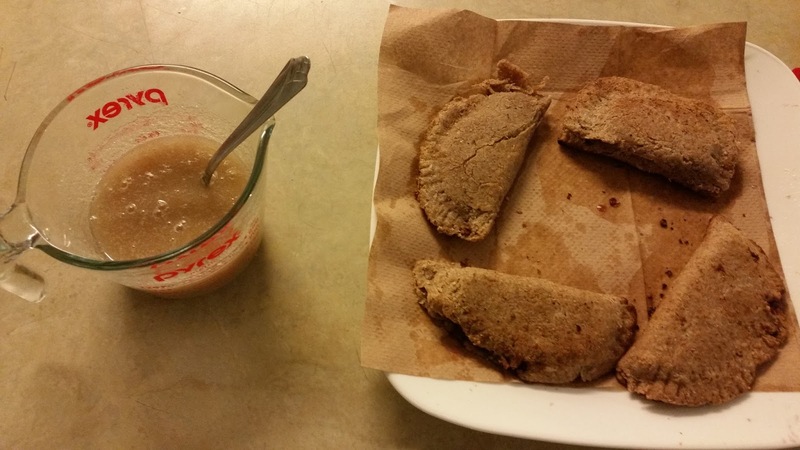 I lived in Gainesville, TX for a while, and miss The Fried Pie Co., so I found a recipe and gave it a shot. The twist? I've been trying to work toward more vegetarian and vegan cooking practices. It's not a total paradigm shift... I still eat meat occasionally. It's more that I've never been much of a cook, and know I need to change my diet a bit... the American diet is HEAVY on carbs. Bread, sugar, and pasta EVERYWHERE! 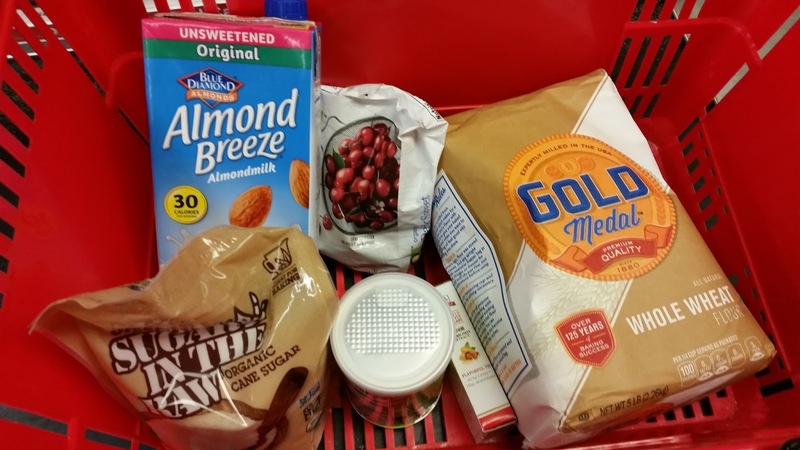 I needed to move more toward protein, fruit, vegetables... not "no carbs", but "less carbs". However, there's an additional caveat... my personal motto: "Keep It Simple, Stupid". I'm incredibly absent-minded, and easily distracted by funny words, shiny objects and squirrels. I need to adjust my diet in ways even a scatterbrain like myself can keep up with! So... simple steps. Example: my previous post! Simple, low-maintenance smoothie and coffee, great meal, super-easy to shop, make and clean up. 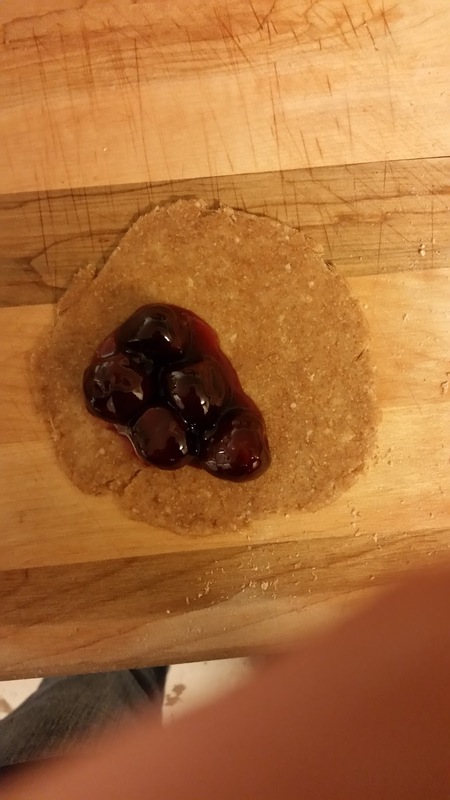 Anyways, with that in mind... FRIED CHERRY PIES! The original recipe is from veganwolf.com, modified by my personal experience and some discussion from vegan cooks I know at my hackerspace, pumpingstationone.org. 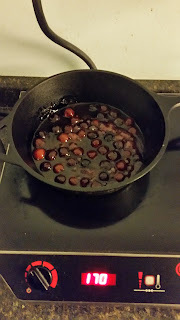 Ended up using a cast-iron skillet on the induction cooktop. Bring to a boil, let boil two minutes, then remove from heat and let cool. I actually let this cook a bit longer... I was working on an induction cooktop, which is still pretty new to me. The filling turned out just fine. I'm considering substituting mixed berries or apples on my next try! The dough was a challenge: it was grainy. This is where the cold water would have helped! Add dry ingredients to wet. 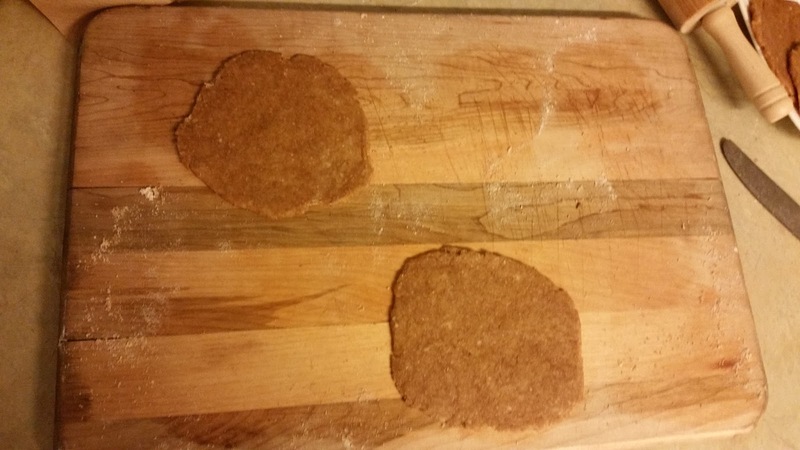 Note: I had difficulty with the consistency of the dough. Talking with my baker friends, apparently adding ice water as needed is an option to help with consistency. Good to know! 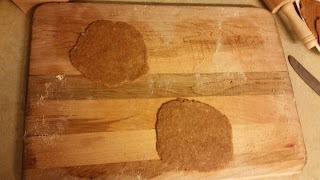 Separate dough into about 10 equal pieces and roll into balls, then roll flat to about 1/8" thick. Spoon filling into the center with about an inch of room around the edge; fold crust over and press closed around the edge with a fork. Not quite what I said, but this is what I did. Made the fold-over easier for me. Yeah, I know... finger on the lens! 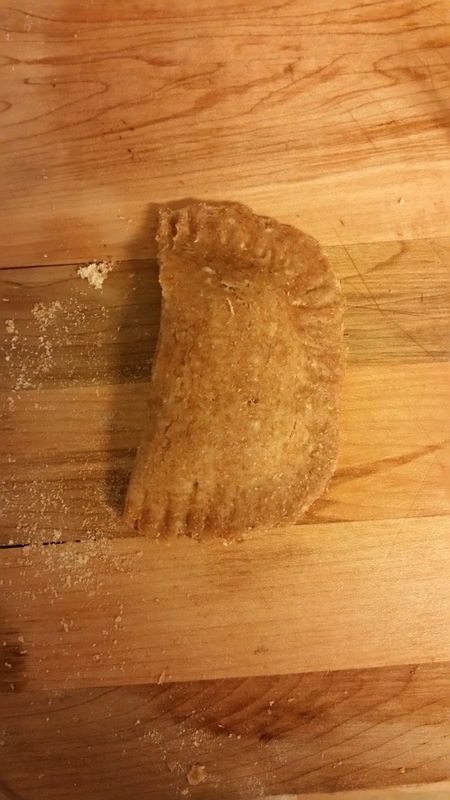 Closed pie, pressed around the edge with a fork. Here was my greatest challenge: FRYING THEM! Especially considering my lack of experience and not being familiar with an induction cooktop. 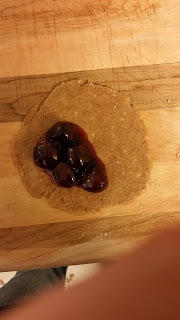 I managed... but, next time, I think I might try deep-frying them instead. Till then... heat about 1/2 inch of oil in a fry pan and fry each pie for about two minutes, or until golden. Frying pies! Not my best moment... more of a learning moment! Mix glaze til smooth, brush on pie while pie is still warm. Let cool. I had a bit of trouble with the glaze, because I forgot to get powdered sugar and didn't find what was in the 'space til afterward... so I tried powdering regular sugar with a mortar and pestle. Because the 'space has a mortar and pestle. It... wasn't the greatest. But it was dessert! I don't think anyone who tried a pie really minded. 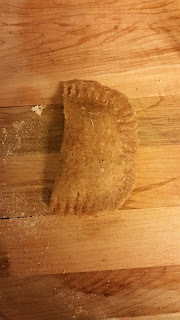 Fried pies, before glazing! I forgot to get a good shot post-glaze. Again, the crust was a bit... grainy. All in all, my pies weren't evenly cooked, and a couple ended up a little well-done on one side... but I learned a LOT! It was quite an experiment. The whole experience took me about four hours and had one casualty (a crust I dropped), but everyone that tried the resulting pies seemed to enjoy them! I think I'll be trying this again, and soon... but, lately, I've been distracted by blacksmithing!